As noted on our Donate page, here at Cover Lay Down we insist on remaining ad-free and non-profit – the better to focus our attention and your support on those artists we tout week in and week out, thus making it possible for them to keep their hands and voices in the game full-time, for the benefit of all. But making and reinforcing connections between musicians and the community they serve isn’t free. The amount of bandwidth it takes to serve our growing readership runs well over a terabyte of data each month, and you just can’t get that sort of pipeline without paying for it. And having technical support at our fingertips means ensuring that the blog, and its coversongs, are here when you need them. And so, a couple of times a year, we come to you, our beloved readers, asking for support to keep the music flowing. Why now? Primarily, because the coffers are low. It costs about a hundred dollars a month to cover our costs, and right now, the account has just enough in it to take us into April. Without your gift, the clock runs out. But in my mind, there’s also a strong parallel between the clock-change of Daylight Savings Time and the pacing of the paycheck-driven life. I’ll be thinking of it when I rise in the dark tomorrow to leave for work on time. And I’ll be pondering its manifestations as I dwell among the various stressors that keep us in tension with the time and attention we spend here on these pages. And these days, I spend a lot of time thinking about money. It’s budget season in our schools, and with the Federal jobs bill gone dry, my role on our local school board has turned once again to our annual examination of how to make do with less. Contact negotiations continue in the inner-city school system where I teach, leaving me uncertain of what the future might bring, or even whether I might still have a job when the process is over. Taxes are coming due, causing us once again to sit at the kitchen counters of our memories and figure out just where our money goes, and whether we’ll need to get second jobs just to afford the basic, bare lifestyle we enjoy. I did not join the school board to manage money, but I recognize that our yearly exploration of the district pocketbook is an important lens through which we reexamine our priorities on the ground. I did not join the teaching field to get rich, but the choice of weekends and summers off has its costs, to me and to my family. 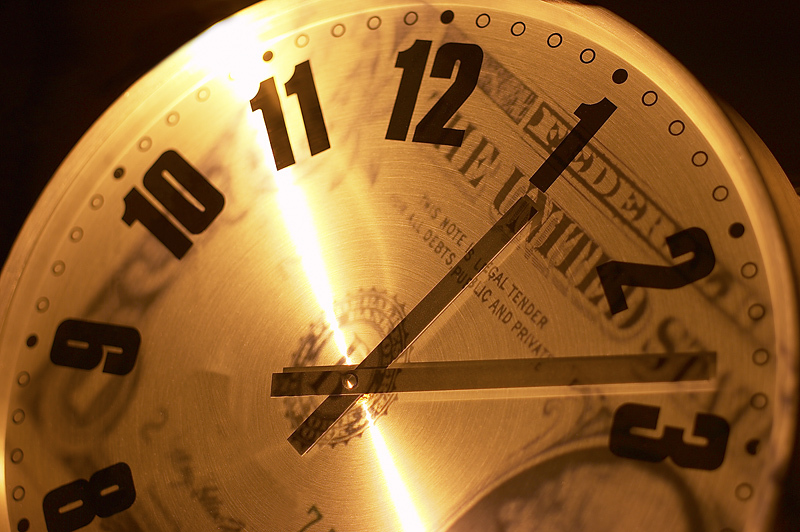 Time, as they say, is money. And the way we ration and gather these precious resources is often less dissimilar than we’d like to admit. Our resources are always limited: to give and take an hour here, a dollar there, is to be deliberate about what we have to give, lending our hearts to that which we think serves ourselves and our communities most. And so we come to you today with hat in hand, asking only that you take a moment out of your busy life to help out, and – in doing so – become a proud supporter of our mission. If you’re a regular contributor, we encourage you to consider renewing your commitment, the better to perpetuate that which you take for granted. If you haven’t donated before, we ask that you consider throwing a few dollars into the pot, the better to ensure that we’ll be here for months and years to come. Give to Cover Lay Down, and help us sustain the words, the music, the artists and the community. Cover Lay Down has been proudly serving artists and fans at the intersection of folk and coverage since 2007 thanks to the support of readers like you. Two weeks since the tornado came through, and by most accounts, we’re making real progress in our tiny town. Houses once broken disappear overnight, leaving empty spaces; others, chimney-less and battered, cover their gaping roofholes with tarps, until the valley below the town hall begins to look like a patchwork quilt: patches of peaked sky blue, newly exposed summer lawns, lumber, the stone grey of bare foundations. People go to work, and school. The local news moves on to other topics; there are long moments when I forget that the place where I live and love and raise my family is still so broken, so needy, so much in pain. A semblance of normalcy begins to settle in us all. Committees are formed to disburse donations; the volunteer coordinators at the First Church now have regular hours, and a database to track those who need, and those who offer. The immediacy of disaster fades into a kind of natural, endless discourse about methodology and priorities, even as the invisible work crews still struggle to cut and move brush and stone across the valley, and the homeless find temporary housing, or move along to their out-of-state in-laws, wondering how and when they will be able to return. The world is brighter than it used to be, now that sunlight streams through where once shade and evergreen woods lined the mountaintops. You can see the downed treetops on the mountains, and the lines of ragged trunks that snakes its way down and through and back up again. The churches and the tall stone performance hall in the center of town are stabilized with tacks and tarps, and surrounded with shiny fences, preserved in the midst of chaos while they await red tape and federal funds, stonemasons and donations. 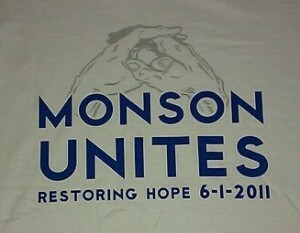 Monson remains united, as the t-shirt says: in our grief, and in our efforts to keep up what has become an increasingly uphill battle to sustain the energy of clean-up and stabilization. But we are not healed, yet, and not out of need. The calls still come, throughout the day on our facebook page, and on signs that litter the broken streets: for chainsaw crews and brush haulers, clothing and bins, ice and water for the workers, dinners for the displaced. Scarred and broken hearts lurk in our bodies, as their physical representations do on our streets. And such scars take longer to heal than we ever remember. For the days come where the rain clouds come in on the wind, and our blood starts to beat a little faster. We scan the darkening sky, measuring the swirls and eddies against our memories; we stay inside, and sit watchful on the couch, facing the picture windows, our chests tight against each other as rain beats on the roof. 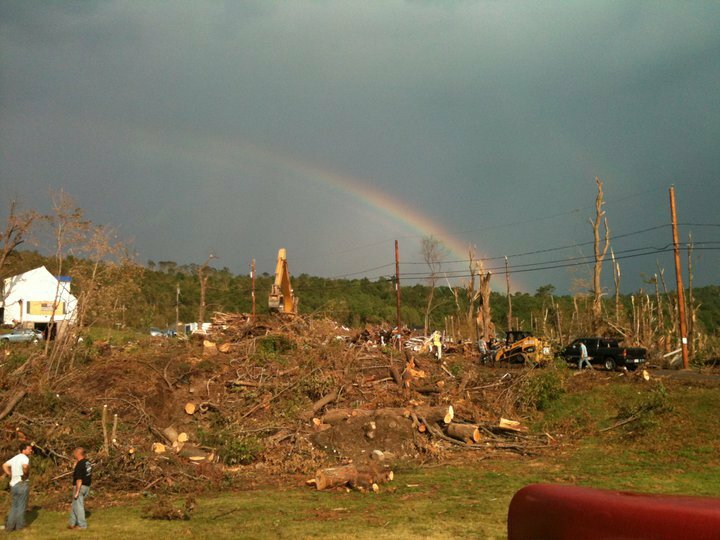 Though the rainbow which comes afterwards, an apparition hanging over the desolation, reminds us of the joy and gratitude we felt in the first days after the storm, its effect, like its existence, is fleeting. And when it is gone, it leaves behind it the exhaustion of change, of the unsettled life, of the dark clouds on the horizon. Some day we will get over it, this irrational fear of clouds. Someday, when we have helped everyone, we will be healed. For now, Cover Lay Down is giving 40% of all donations before the end of June to tornado relief, to help the hundreds of people still in need in our community. Please consider giving what you can, and rest assured, we’ll apply your donation to real people in real need, where it can make the most difference to rebuilding a town ravaged by natural disaster. I’ll even throw in a 10-song exclusive download – all live, all covers, all recorded by yours truly in the last 12 months – for anyone who donates. And all you have to do is click here to help. Here’s a few songs about the slow process of rebuilding our hearts, and the world, after loss transforms us, to keep us going as we rebuild the world together.